That last bit of catchup covered 13 weeks: four in late February/early March; four in May/June and five from late July and all of August. I learned more about the process and how I like to work as I put it all together. I absolutely love the finished product and I love the creative process … as long as it doesn’t take more than a couple of hours and I’m not playing catchup. 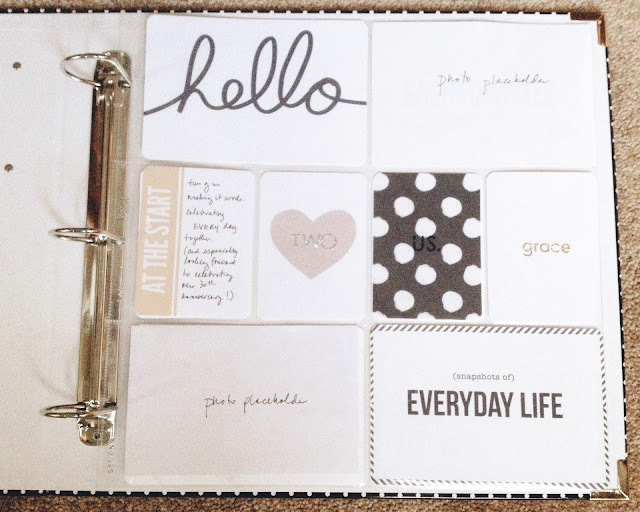 In all that excitement I signed up for a three-week on-line class called Project Life Lessons (one of the three teachers is Elise Blaha; I’ve followed her blog for years and love her style and her album!) Class started Thursday…and week 36 ended Saturday. No more catchup! I certainly hope to have new tips and techniques to incorporate over the next few weeks, but not yet. My new much-simplified approach is to print all the inserts myself (if anyone wants a barely used Clementine kit, I have one for you!). I did splurge and buy a few new digital products, including both the Seafoam and Midnight Project Life core kits and a few photo/journaling cards from Paislee Press (Elise Blaha designed Seafoam and Liz Tamanaha designed the rest); but I got the album half-price at Michael’s! I’m also including a lot less – like half of what I was doing before. Week 36 took me barely two hours to pull together yesterday and I love it as much as some I labored over. All five of the photos I included appeared on Instagram last week (four from my feed and one from Marc) and I think that’s going to be pretty typical. Three of mine were prompted by the FMS daily photo challenge and that’s probably going to be typical, too, as long as they help me tell a story. 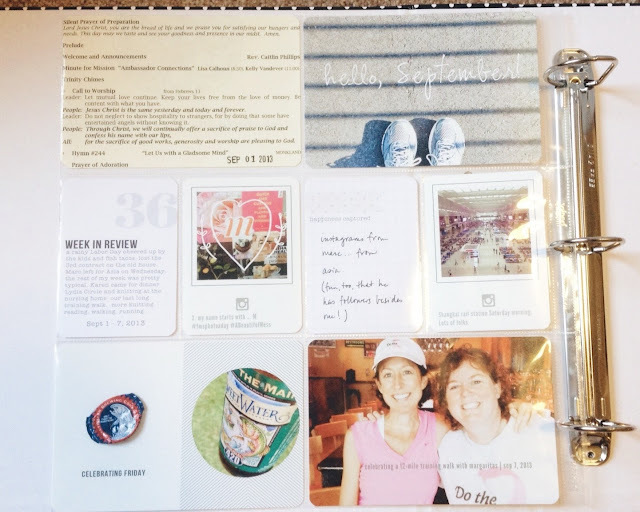 Loving Cathy Zielske’s Instagram template (used on the middle row’s 2nd and 4th inserts) – it was free on her blog a few weeks back. I had more time last night and made the album cover page (I still need to add two photos but I want at least one of them to include Marc and he’s not here!) I am kind of in love with the color scheme of black & white, with pops of gold and kraft. Maybe because it seems fall-ish? …another lesson learned is that quick blog posts are more likely to happen with iPhone photos edited with PicTapGo or Afterlight – and no links! Your pages are a beautiful chronicle of life in 2013. You make this looks so easy and fun. Looking good Mary! I love all of the ideas you bring to us. You inspire me each and every time. It must feel great to be caught up! Hopefully you can keep that momentum going forward! yea for getting caught up-picking up photos from costco today so i'll be right there with ya! I would be a lost cause for something that required that kind of attention! You make it look fun and easy, though. Just beautiful! And such a wonderful "journal" of your year.